I’ve been reflecting on the idea of measuring resilience since the conference in Montpellier last month where @vgalaz quipped “Resilience metrics is the new black @resilience2014”. Efforts to measure resilience are well underway while at the same time there are concerns about what exactly is being measured and whether this shift in focus misses the point of what resilience thinking has to offer. My own thinking on this is that it depends on what you are trying to achieve but a deeper understanding of both perspectives is likely to benefit both approaches in the long-term. The Resilience 2014 conference aimed to facilitate dialogue among researchers and practitioners from the resilience research community and the development community. To date, resilience has been conceptualized and applied in a variety of ways. Research along the lines of Holling, Gunderson, Folke, and Walker as well as many others in the Resilience Alliance network and beyond, has emerged from a complex adaptive systems’ perspective and in particular, a focus on ecosystems and integrated social-ecological systems. By contrast, development communities tend to approach resilience from a more human-centered perspective with a focus on livelihoods, risk reduction, and human well-being. What both communities hold in common is a desire to operationalize resilience by applying theoretical insights to real world problems and changing the way we manage and interact with the environment for more sustainable and equitable outcomes. The rapid uptake of resilience thinking by development agencies and foundations has forced the issue of resilience implementation and challenged the research community to make the leap from theory to practice to metrics. While resilience practice is not entirely new (see Walker & Salt 2012) and case studies have informed theoretical advances over the years the wide-ranging application of resilience thinking to development issues, is a relatively recent phenomenon. Development programs and projects operate within a different realm and have their own established frameworks, protocols, and practices. Notably, development programs require well-defined mechanisms for evaluating interventions and more specifically, metrics for quantifying and judging the success of their actions and investments. Thus the challenge that presents itself is how to measure resilience, if indeed it can or should be measured? This is a nuanced question, and much like the concept it addresses, there are multiple dimensions and no easy answers but it remains a worthy pursuit. There is a concern shared by many that resilience may not live up to its promise for a variety of reasons including the potential for narrow interpretations and a selective or limited understanding of what can be a relatively abstract concept, but also because of a what some have identified as a lack of quantifiable metrics for evaluation purposes. In Luca Alinova’s plenary presentation he spoke of the very real threat of resilience being adopted and applied in name only, whereby others capitalize on the current trendiness of the concept while much of the same ineffective practices continue under the guise of a new name. In his words “there is a big risk of labeling some bad habits with a new name”. Any failures of course, will have a handy scapegoat and an enormous opportunity will have been lost. Similarly, there is a real risk that in the rush to measure resilience and develop quantitative metrics for comparative purposes, what is actually measured may represent the same things that have long been monitored and measured but are now being packaged in the language of resilience to meet the demand. The fact remains however, that resilience will and already is, being measured. If resilience must be measured to be meaningful to the development community, then how best to measure it? Luca Alinovi suggests we need to measure resilience at the household level rather than at an individual level because it is the interactions that are important. He also cautioned though that we are still far away from the dynamic analysis that is needed as well as a general approach for different types of systems. Much of the discussion at Resilience 2014 around the topic of metrics tended to focus on food security and crisis impacts. Alexis Hoskins presented on the progress being made by the Food and Nutrition Security Resilience Measurement Technical Working Group that has produced a framing paper outlining the challenges in measuring resilience. They have also produced a set of resilience measurement principles that echo Alinovi’s call for dynamic analysis and reflect both systems-based requirements (multi-level interactions, rates of change, inherent volatility) as well as human dimensions (e.g., desirability of system states, people’s perceptions, vulnerability connections). The recommendations and next steps that follow from the measurement principles appear promising because they account for the underlying concepts of complex systems dynamics and cross-scale interactions, while recognizing the need for both quantitative and qualitative data to understand causal mechanisms. Other presenters similarly advocated for a mixed method approach to measuring resilience, combining qualitative and quantitative data, as well as steps for interpreting data and providing the necessary contextualization that metrics alone cannot fully capture. Yet another type of approach offered by Christophe Bene, was a resilience proxy based on the cost of impacts calculated from the sum of anticipation costs + impact costs + recovery costs. Bene’s postulate being “the more resilient an individual the lower the costs it takes to get through a specific shock”. Assigning monetary values as a means of measuring resilience has many parallels in the ecosystem services literature, which increasingly recognizes the need to also consider nonmonetary values. There is clearly something to be gained by measuring resilience, but any formula attempting to capture a dynamic system property will inevitably involve tradeoffs for simplifying purposes and something will be lost. Understanding exactly what is missing from resilience metrics or what is potentially lost with a shift in focus from understanding the resilience of a system to measuring the resilience of a system remains to be clearly articulated. In resilience assessment, a main objective of the exercise is to re-conceptualize a system, place, or issue from an alternative perspective, i.e., through a resilience lens and focusing on interactions such that new insights emerge and interventions can be better informed. How a system behaves is not a function of the sum of its parts so it follows that measuring component parts cannot capture what is meaningful about resilience. 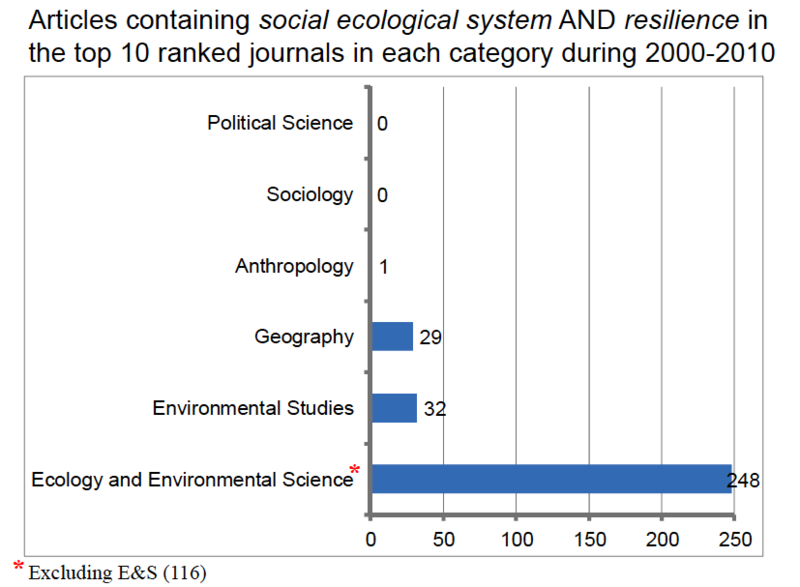 To date, most metrics being proposed focus on social variables and the human dimensions of resilience, as opposed to taking an integrated social-ecological systems (SES) approach. Conceptualizing humans as part of nature and placing people within ecosystems, instead of keeping them separate, represents an important advance in resilience research and sustainability science more broadly. Metrics for resilience and more generally, the application of the concept in practice also stands to benefit from taking an SES approach. It has been said before that resilience is an overarching concept that encompasses many other core concepts. Biggs and colleagues (2012) identify seven principles for building resilience of ecosystem services. Assuming a given bundle of ES is desirable (and knowing for whom it matters), these seven facets can be managed to strengthen and enhance the resilience of the system. They include: maintaining diversity and redundancy, managing connectivity, managing slow variables and feedbacks, fostering complex adaptive systems thinking, encouraging learning, broadening participation, and promoting polycentric governance systems. To the extent resilience metrics can effectively address these seven principles, they would provide valuable information to anyone wanting to characterize and monitor the capacity of the system to maintain a desired set of ecosystem services in the face of continued change or disturbance. A final consideration is that resilience is not always a good thing. As Brian Walker stated in his plenary presentation, part of the understanding required is knowing where we need to build resilience, and where we need to reduce it to enable transformation. A range of different types of traps characterized by rigid social and ecological processes that are tied to environmental degradation and livelihood impoverishment make change a real challenge (Boonstra and de Boer, 2014). Where traps exist, the goal may be to reduce the resilience of the current state of the system and build transformative capacity, which may require monitoring and measuring a different set of variables. Measuring resilience should be possible but finding suitable indicators and metrics that retain key attributes of the concept will also need to reflect the fact that resilience is a means and not an end. Biggs et al. 2012. Towards Principles for Enhancing the Resilience of Ecosystem Services. Annu. Rev. Environ. Resour. 37:421-48. Walker, B. & D. Salt. 2012. Resilience Practice: Building capacity to absorb disturbance and maintain function. Island Press, Washington, D.C. In the Guardian’s Poverty Matters blog Lawrence Haddad, director of the Institute of Development Studies (IDS) in the UK, writes What impact have the global crises had on development thinking? He summarizes some of the findings from an effort at IDS to assess how the financial, fuel, and food crisis of the past several years have shifted the assumptions underlying development. When many of us were taught economics, growth was sometimes seen as sufficient for development and always necessary. [Our study] concluded that some kinds of growth are necessary, others irrelevant, and some harmful. Growth should be treated like technology: with the right governance, it can advance human wellbeing. The growth we want is economic development that is potent in reducing poverty, uses natural resources sustainably and emits significantly fewer greenhouse gases. Too much research on growth is focused on how we get it, rather than how we get the type we need. We get the growth we want by focusing on: creating the right initial conditions (such as low inequality); reducing entry barriers for new, small businesses; setting key prices at appropriate levels (as with carbon production); and adopting stronger transparency mechanisms to allow society to pressurise corporations. Unfortunately the full study only seems to be available as a book. In the 1930s the American art collector Albert Barnes commissioned Henri Matisse to produce a major painting for his private gallery in Merion, outside Philadelphia. Matisse was ecstatic: He rented an old cinema in Nice, where he lived at that time, and spent the entire next year completing the work, a dance triptych. He was pleased with the result. But when the piece arrived in Merion, Barnes wrote to Matisse explaining an unfortunate oversight: His collaborators had taken the wrong measurements, so the painting did not fit on the gallery wall. The difference in size was marginal, and Matisse could easily have tweaked the triptych to fit the wall, a technical fix. But instead he rented the cinema for another 12 months to complete a new painting with the right dimensions. Moreover, since he felt that mindless duplication was not real art, Matisse considerably changed the concept, effectively creating a whole new design. And in this process of reworking the piece, as he experimented with forms that would capture the dancers’ rhythmic motion, he invented the famous “cut outs” technique (gouaches découpés), what he later labeled “painting with scissors.” Whether consciously or unconsciously, Matisse turned a mistake into an opportunity for innovation. The new triptych not only pleased Barnes, but also served as the stylistic starting point for what would later become Matisse’s most admired works. The French master’s ad hoc ingenuity captures the essence of an emerging concept known as resilience. Loosely defined, resilience is the capacity of a system—be it an individual, a forest, a city, or an economy—to deal with change and continue to develop. It is both about withstanding shocks and disturbances (like climate change or financial crisis) and using such events to catalyze renewal, novelty, and innovation. In human systems, resilience thinking emphasizes learning and social diversity. And at the level of the biosphere, it focuses on the interdependence of people and nature, the dynamic interplay of slow and gradual change. Resilience, above all, is about turning crisis into opportunity. 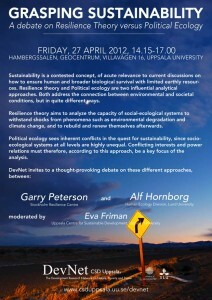 Resilience theory, first introduced by Canadian ecologist C.S. “Buzz” Holling in 1973, begins with two radical premises. The first is that humans and nature are strongly coupled and coevolving, and should therefore be conceived of as one “social-ecological” system. The second is that the long-held, implicit assumption that systems respond to change in a linear—and therefore predictable—fashion is altogether wrong. In resilience thinking, systems are understood to be in constant flux, highly unpredictable, and self-organizing with feedbacks across multiple scales in time and space. In the jargon of theorists, they are complex adaptive systems, exhibiting the hallmark features of complexity. Kit Hill a Masters student at the Stockholm Resilience Centre made the three short videos below to introduce the concept of resilience and the idea of a regime shift. Resilience from Kit Hill on Vimeo. Beating Down Resilience from Kit Hill on Vimeo. Regime Shift from Kit Hill on Vimeo. This video was made in order to help people understand the concept of a Social Ecological Regime Shift. Kit’s efforts are part of a larger project to create a set of communication and teaching resources that can be used to communicate different aspects of resilience thinking. Stockholm Resilience Centre, Brian Walker and David Salt’s book Resilience Thinking, or collection of resilience papers on Mendeley. …collaborations are linking those exploring the human microbiota in the intestine, skin, mouth and other surfaces with microbial ecologists, such as Banfield, who have already made a career out of studying microbial universes in environments such as soil, ocean water and toxic waste sites. The human microbiologists need the help. Although work by Relman and many others over the past five years has gone a long way to building up a genetic catalogue of human microbiota — what types of microbes live where — it has also revealed its staggering and previously unappreciated complexity. With hundreds of interacting, coevolving species living in and on every individual, and frustratingly little species overlap between each person’s microbial population, understanding the connection between microbes and health seems more daunting than ever. Researchers want to know what role the body’s microbial inhabitants have in immune function, nutrition, drug metabolism and conditions as diverse as obesity, cancer, autism and multiple sclerosis. But to do so, they have to sort through an avalanche of genetic sequence to find out what microbes are in the community, how they change over the course of a day, a lifetime or after a change in diet, and which functions are served by particular microbes, combinations of microbes or microbial metabolites (see ‘Exploring the superorganism’). Microbial ecologists are supplying some of the expertise and bio-informatic tools to help make sense of the data mountain. They are also bringing to the human microbial field ecological principles such as colonization, succession, resilience to change, and competition and cooperation between community members. “It’s hard not to think about ecology when you enter the field,” says Jeff Gordon, a leader in gut microbiology at Washington University in St Louis, Missouri. In return, specialists in human microbiology are attracting funding and attention that ecologists have sometimes struggled to find. “The arbitrary and false barriers between environmental and medical microbiology are breaking down,” Gordon says. Ecological concepts are also helping to account for the substantial differences that most studies have found between the microbiota of individuals — even, to a lesser extent, between identical twins. Ecology offered a likely explanation in the form of redundancy. The idea now is that every person’s microbes provide a core set of genes or biological functions, regardless of the specific species encoding them. “If you look at grasslands in different parts of the planet, there’s a common morphology and function,” says Gordon, drawing parallels. “But in different locales, the component species are quite distinct.” Gordon and other researchers hope that more extensive sequencing and analysis of many individuals’ microbiomes will reveal what those core functions are. Relman, meanwhile, has become interested in finding ‘keystone species’, rare species that nevertheless have a vital role in a community, and he is working with a colleague at Stanford, bioengineer Stephen Quake, to sequence the genomes of single microbial cells from the gut. Google trends result for resilience. Scale is based on the average worldwide traffic of resilience in all years. Olivier Barreteau is seeking a post doc candidate for 18 months starting as soon as possible to work with him at Cemagref in Montpellier, France. Note: French is not compulsory for this position. The post doc will help initiate a project on Communities and Climate Change, which we are currently setting up with colleagues in the US and Netherlands. Olivier is planning on focusing this postdoctoral work on defining the indicators of resilience of SES, at least on their social part. The process for a post-doc at Cemagref is that the candidate writes a proposal, with help from the team (ie Olivier), and the proposal is assessed (candidate + subject) by an internal commission. There is one commission for evaluation each month. If the candidate and proposal are good, it will go through. If there is someone with a background in resilience who is interested they should contact Olivier Barreteau (olivier.barreteau at cemagref.fr).